We are a little obsessed with the Little Mermaid right now. It might be because they are showing a ton of commercials for it on the Disney channel right now and it might be because that was always my favorite soundtrack to sing and I am just using having a little girl as an excuse. Either way, when I saw a fun under the sea themed birthday party on Pinterest I had to check it out. 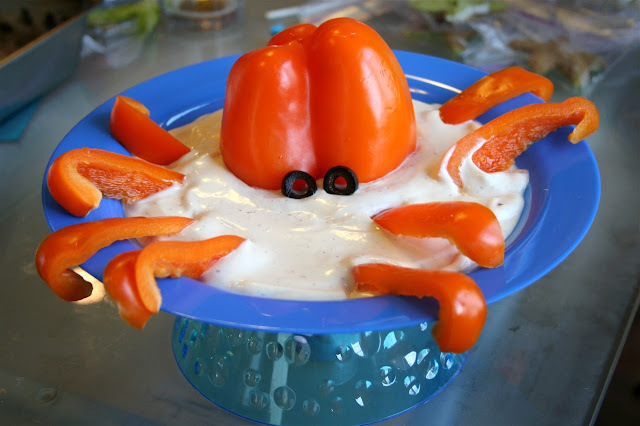 I immediately fell in love with this fun octopus dip idea. Great for a ocean themed birthday for a boy or a girl. Even a pirate is bound to run into an eight legged monster of the sea once in a while. You can check out the octopus dip and the other mermaid party ideas over at Denna's Ideas.